INT-GSM is used in conjunction with the INTEGRA Plus control panel, the e-mail messaging option is also possible. The content of all messages, regardless of how they are transmitted, is based directly on the event list and is generated automatically. Communication with the control panel via the INT-GSM module can take place through the SATEL connection setup service. 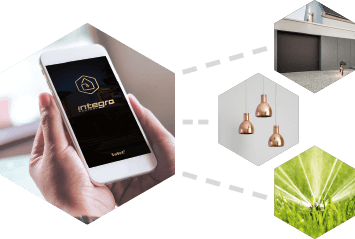 operate the system from INTEGRA CONTROL mobile app. Combination of INT-GSM and the ETHM-1 Plus communication module makes it possible to use the GSM network as a spare transmission path for INTEGRA or INTEGRA Plus control panel (as an alternative to Ethernet communication). As regards the reporting function, the installer can set priorities for using individual communication paths – Dual Path Reporting – as required by the EN 50136 standard. INT-GSM is a GPRS communication module that allows INTEGRA and INTEGRA Plus series of alarm control panels to communicate via GSM network. The device operates on control panel’s keypad bus. It supports two SIM cards, through which it can receive messages and incoming calls - at the same time. All GPRS transmissions are encrypted in the AES-192 standard. INT-GSM reports events to two monitoring stations (eg. security agencies) via the GSM network. For this purpose it uses GPRS and SMS messages, with the possibility of setting the priority for each of the mentioned transmission paths. Event notifications are created automatically based on the control panel event memory. The module sends information via SMS messages or CLIP service (up to 16 numbers) and, in case of cooperation with the INTEGRA Plus control panel, also e-mails (up to 16 addresses). After installing the INTEGRA CONTROL app, on the smartphone, PUSH notifications are available. 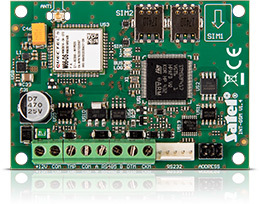 A big advantage of INT-GSM device is the ability to work with the ETHM-1 Plus Ethernet module (RS-485 port connection). By default, GPRS is a backup communication channel for Ethernet. The duo allows for realization of Dual Path Reporting, in accordance with EN 50136, as well as for determining the priority of event monitoring tracks (Ethernet, GPRS and SMS). Communication via the GSM network enables wireless connection of the control panel and the computer with the installed DLOADX and GUARDX programs, and thus the configuration and management of the system, even from a remote location. Connection between the module and PC can be established via the SATEL connection setup service. Module software updates are made via the RS-232 port or remotely via GPRS, using the UpServ software.